EXAIR’s new Catalog 32 is the source for compressed air savings and safety; a full colour technical guide offering engineered solutions to common industrial conveying, cooling, cleaning, blowoff, drying, coating and static electricity problems. 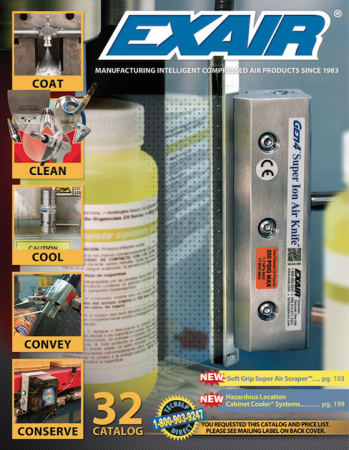 The expanded Catalog 32 introduces new Super Air Scraper Nozzles, Soft Grip Super Air Scraper Safety Air Guns and Hazardous Location Cabinet Cooler Systems. The Super Air Scraper is a patent pending nozzle used to eliminate stubborn debris from work or machine surfaces. This 2 inch flat nozzle utilizes a corrosion resistant scraper blade to provide needed leverage to get underneath and scrape away fixed debris. The Soft Grip Super Air Scraper is a safety air gun designed to help remove stubborn debris. This air gun is available with a 6 inch to 72 inch long extension to provide the strength and durability necessary for many of your toughest cleaning challenges.